NEW! STiKidotz Greeting Cards are a brand new STiKidotz product that let you create and send one-of-a-kind cards. Each package is exclusively designed around our STiKidotz characters. Decorate your STiKidotz, then stick it in place on cover and send! Easy, creative and fun. Blank Inside. The cute bear holding a heart on the cover is the placeholder for your own STiKidotz bear. The dotzBLOK that are included allow you to recreate our pixel design or make your own. After you design your STiKidotz bear, remove the backing and stick the bear in place, write or draw any message on the inside and it's ready to send. Package includes: 1 Greeting Card (blank inside), 1 Envelope, 1 STiKidotz Bear, 1 instruction card, 13 dotzBLOKs in the covers shown. The cute panda holding a heart on the cover is the placeholder for your own STiKidotz panda. The dotzBLOK that are included allow you to recreate our pixel design or make your own. After you design your STiKidotz panda, remove the backing and stick the panda in place, write or draw any message on the inside and it's ready to send. Package includes: 1 Greeting Card (blank inside), 1 Envelope, 1 STiKidotz panda, 1 instruction card, 12 dotzBLOKs in the covers shown. 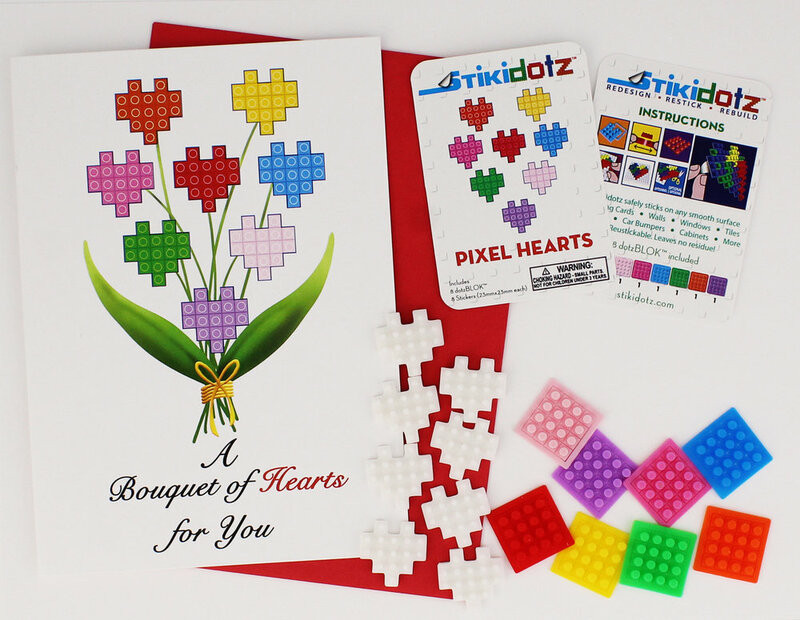 This beautiful bouquet of flower hearts are the placeholder for your own STiKidotz hearts. The dotzBLOK that are included allow you to recreate our pixel design or make your own. After you design your STiKidotz flowers, remove the backing and stick the hearts in place, write or draw any message on the inside and it's ready to send. Package includes: 1 Greeting Card (blank inside), 1 Envelope, 8 STiKidotz hearts, 1 instruction card, 8 dotzBLOKs in the covers shown.